Description: The Stone Pendant is a decorative knot that is designed to wrap around a stone, marble, or similar item. It surrounds the stone snugly, like a frame, so it's not a flat design. Try to use a stone that is oval in shape and has thick edges. Make the pendant first, then search for a stone that will fit. You should add glue if you want the stone to be permanently attached to the cord material. 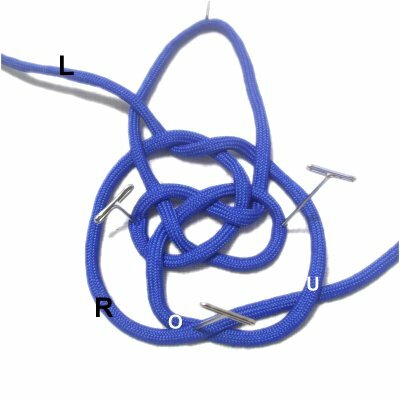 This project is somewhat challenging for beginners, so you should have some experience tying Macrame knots in general before you try to create it. 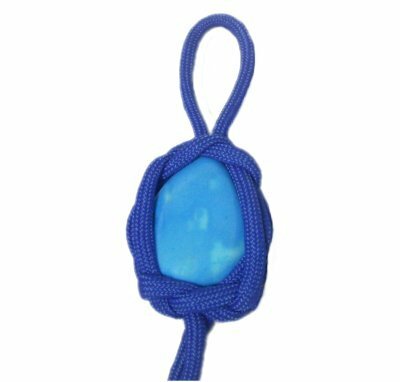 Important: This Micro-Macrame design is NOT suitable for cabochons, since they are too thin and will slide out of the knot. The Pendant Setting is better for using flat stones, cabochons, or coins. Click on the image or link to view the page. 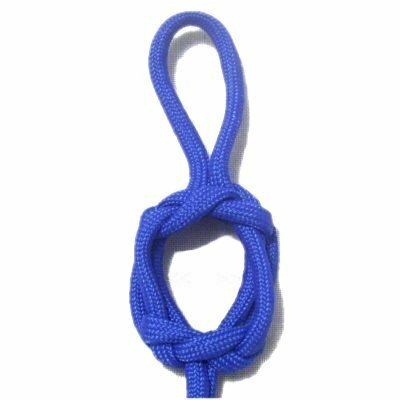 The Stone Pendant design is on the Fusion Knots website, under the name "Marble Lantern". 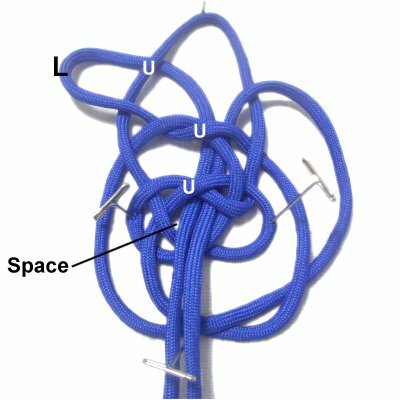 See the video gallery to view the tutorials for other interesting knotting techniques and designs. 2017 Update: The first 3 steps described below have been changed, so the base is easier to make. Contact me if you need the original version. Step 1: Cut one cord, 60 inches long. Apply TAPE to the tips to prevent unraveling. 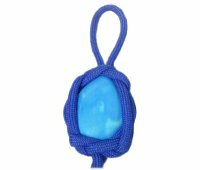 When using Parachute cord to make your Stone Pendant, melt the tips with a flame so the inner fibers cannot slide out, then apply tape. Step 1: Secure the cord to your board in the center. 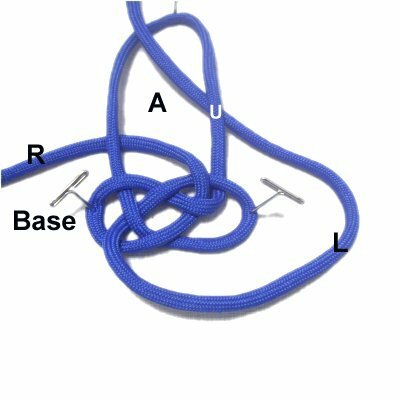 Use the left half to make a counter-clockwise loop, passing the end under to make the crossing point. 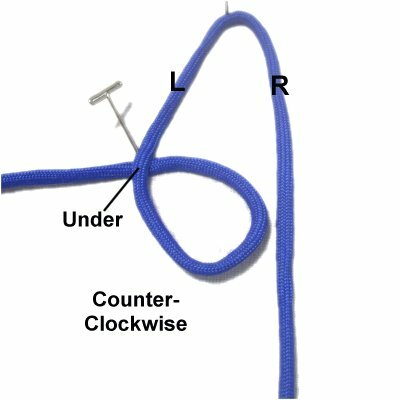 The loop should rest 2 inches below the secured area. 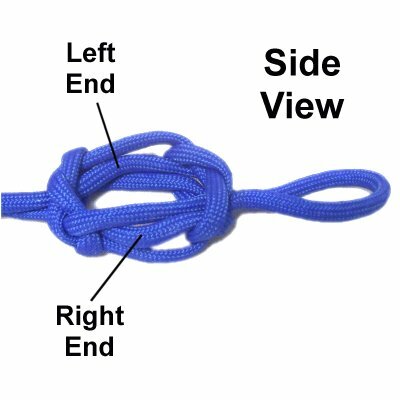 Step 2: Fold the right half of the cord as shown, sliding it partially under loop 1, and over the area above it. Step 3: Move the right half of the cord under the left half as you bring it down and to the right. 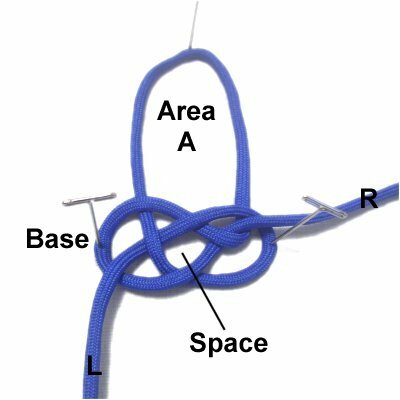 Weave it through the first loop, over - under - over the three segments. Pass it over the portion on the outside. Step 4: Tighten and balance the design, which is called the base. 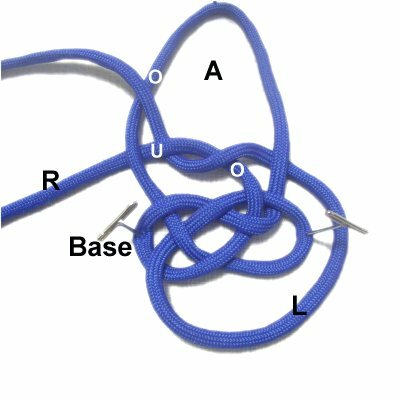 Keep both loops secured to your board while you construct the rest of the knot. The portion closest to the center should be mentally labeled "area A". It should still be secured at the top (center). Important: Note the diamond shaped space in the center of the base. As you work on the rest of the Stone Pendant, make sure you can identify that space, since it's important in steps 9 and 10. Give yourself plenty of room between the top of area A down to the base. Step 5: Move the right half of the cord over the top right area of the base. Then move it to the left, passing under the left side of area A. Designer's Tip: You will be working in the areas above or below the base for the remainder of the Stone Pendant. Identify the base, and the diamond shaped area, before you complete each step. 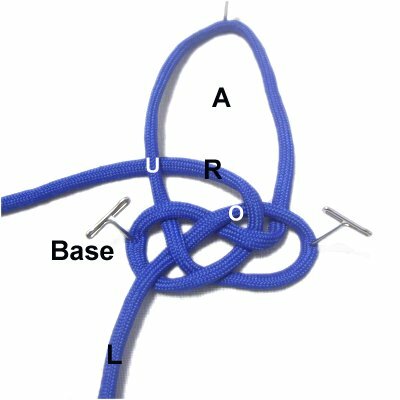 Step 6: Move the left half of the cord in a counter-clockwise direction, around the base. Bring it under the right side of area A. 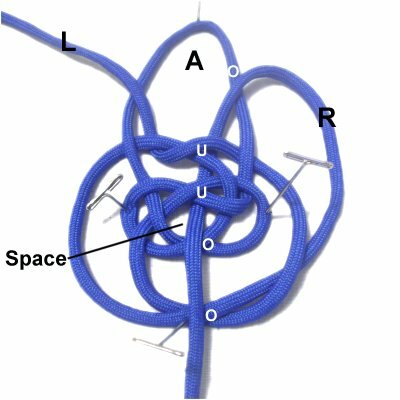 Step 7: Bring the left half over- under the right half of the cord, where you curved it to the left above the base (step 5). Move it up and to the left, passing over the left side of area A. Step 8: Move the right half of the cord down to the area below the base. Pass over - under the left half of the cord, in the area were you moved it around the base in step 6. Secure it where the two cords cross. Important: Make sure you can clearly identify the base and the diamond shaped space, before you work on the next step. Step 9: Bring the right end up to area A, passing over the right side of it. Pass it under the two crossed areas as you pull it out through the diamond shaped space. It will pass over the remaining segments below the space. Step 10: Bring the left end up to area A, passing under the left side of it. Pass it under the two crossed areas, making sure it stays to the left of the other end. Pull it out through the diamond shaped space. Step 11: Keep area A secured to your board, but removed the other pins. Pick up the base and ends with one hand, and pull downward. 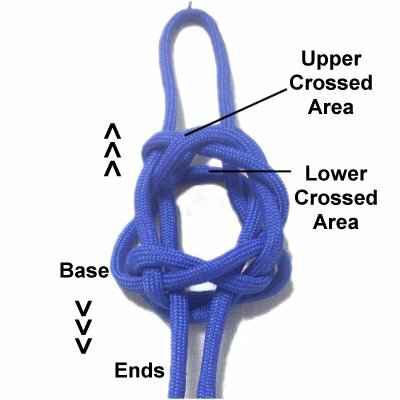 The remaining segments should be pushed upward with your other hand. Step 11, continued: The lower crossed area that you constructed in step 8 will be moved to the top area of the Stone pendant. It should be resting behind the upper crossed area. Remember that the Stone Pendant is not flat. As you tighten, there should be four distinct areas -- top, bottom, and sides. Tighten the base first, then gradually remove the slack all the way through the knot. The area at the top will look similar to the base. 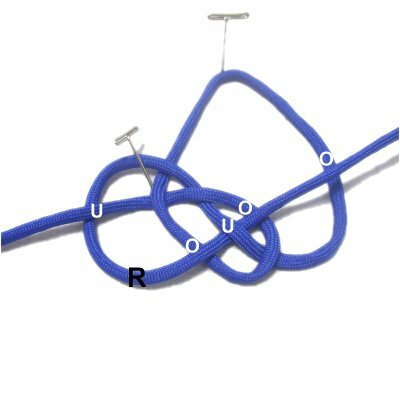 Reduce the size of the top loop (area A) if necessary. The two ends are pushed to the sides and will rest between the other two segments. Tighten and shorten the knot gradually, until the pendant is slightly smaller than the stone. Place the stone inside, stretching the knot to fit. 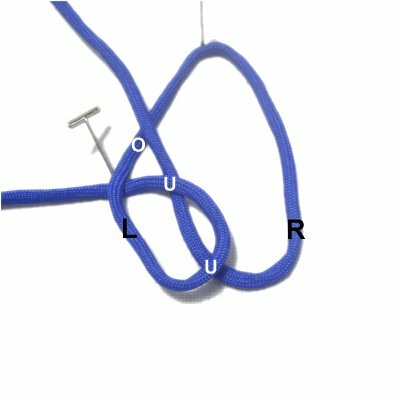 Pull on the ends and the loop firmly. You can add glue if you wish. Have any comments about the Stone Pendant? Contact Me.